For half a century, nowhere has embodied the phrase “so near, and yet so far” for Americans more than Cuba. Cuba is only 93 miles from Key West, Fla., but for the average American, for decades it may as well have been on Mars. Home to 11 million people, the Caribbean island nation is the size of Virginia. Due to the travel and trade embargo imposed by the United States since the early 1960s, Cuba’s colorful and dynamic culture, and its turbulent political scene have been shut out from much of the world. “Cuba is beautiful, yet bizarre,” says Cesar Gonzalez, pastor of Chesapeake Conference’s Cambridge (Md.) church, who traveled to Cuba this past February with a group of Chesapeake pastors, administrators and lay leaders. “Havana is one of the most beautiful cities I’ve ever [seen]. But, it’s just falling apart,” he says. In 2009 the Obama administration opened the door for Cuban-Americans to freely travel to Cuba. In 2011 they expanded the list of sanctioned reasons for visiting Cuba to include academic studies and missionary work. Though the Cuban government had long persecuted religious people, without Soviet assistance, in the 1990s, Cuba became open to churches providing some of the social support it no longer could. 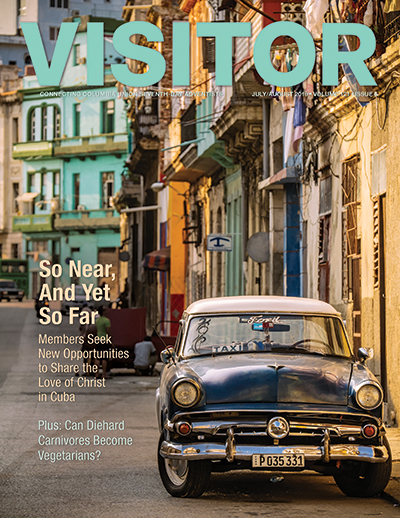 Don Noble, Maranatha Volunteers International president, and Tim Suarez, Cuban-born board member, approached the government in 1994 seeking permission to build churches. “Before you build any new churches, we want you to fix the churches that already exist,’” the government told Kyle Feiss, Maranatha’s vice president of marketing and projects. In the past 20 years, Maranatha built and rebuilt more than 200 structures, many of them house churches with an oversized living room and living space for the host family. The Cuban government allowed the Seventh-day Adventist Church to keep some buildings it owned prior to communism, but didn’t support proselytizing and growth. House churches then filled the need for worship space. In late May, Dianne Trickett, a member of Chesapeake’s South Carroll church in Westminster, Md., traveled with Maranatha to help build a new church in Cardenas. The Cardenas congregation worked and prayed for more than 20 years for a new building, facing purchasing and permit hurdles. Paulo Macena, New Jersey Conference Youth Ministries director, led another group to Cuba this July. Some 50 volunteers helped remodel a church, conducted VBS in multiple locations and connected with the people. The group lodged at the Adventist seminary in Havana. Cuban pastors in New Jersey helped organize the trip. Over the past 20 years, Adventist membership in Cuba has more than tripled, from 11,000 to more than 35,000. When the Chesapeake group led evangelistic meetings in February, they preached to standing-room-only crowds. They served 11 churches in the Pinar del Rio Provence, about two hours southwest of Havana, and donated a projector and computer to each congregation to assist in future evangelism. Chesapeake’s evangelistic series concluded with several dozen baptisms. The group is still learning of new baptisms resulting from hundreds of ongoing Bible studies in the wake of their meetings. Gonzalez was also surprised by the relatively high standard of living. “The vast majority of homes were concrete, with power and water, and built to survive storms,” he says. There are a growing number of union members responding to Cuba’s needs. For instance, members from Potomac’s Seabrook church in Lanham, Md., have ministered there for more than three years. This summer member Gavin Simpson, who now attends the New Market (Va.) church, and 14 others from Seabrook, Pennsylvania, New York and Connecticut traveled for a fourth mission trip to host three evangelistic meetings and several health fairs in rural communities. Simpson’s group spent more than $2,000 to purchase Bibles, tracts and various Ellen White books. The Cuban Union president reported that they were the first group of missionaries, that he knew of, to visit Cuba and invest in literature for the church. Perez immigrated to the U.S. at age 18, in 1962, a year after the failed Bay of Pigs Invasion and just two months before the Cuban Missile Crisis. He did not return until 2012. Perez is especially focused on identifying needs for the Cuban seminary, including housing for teachers, a library and cafeteria. “Our latest project, which [has] been supported by [KAHC] and the Columbia Union, among others, is the acquisition of a 10-acre tract of land next to the seminary, the only land available,” he reports. “It’s critical because that’s where the only working well in that area is located.” Four other drilled wells came up dry, says Perez, adding they are in the midst of acquisition now. 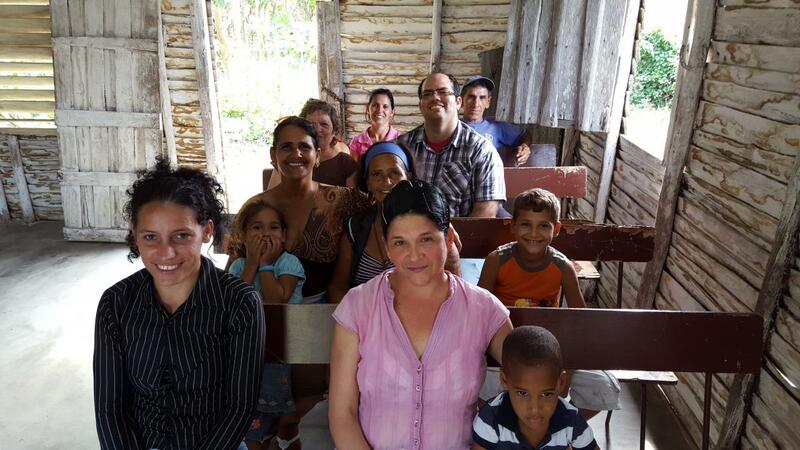 Second Photo: Chesapeake Conference Pastor Ricardo Cala (wearing glasses), fellowships with a study group in Pinar del Rio. 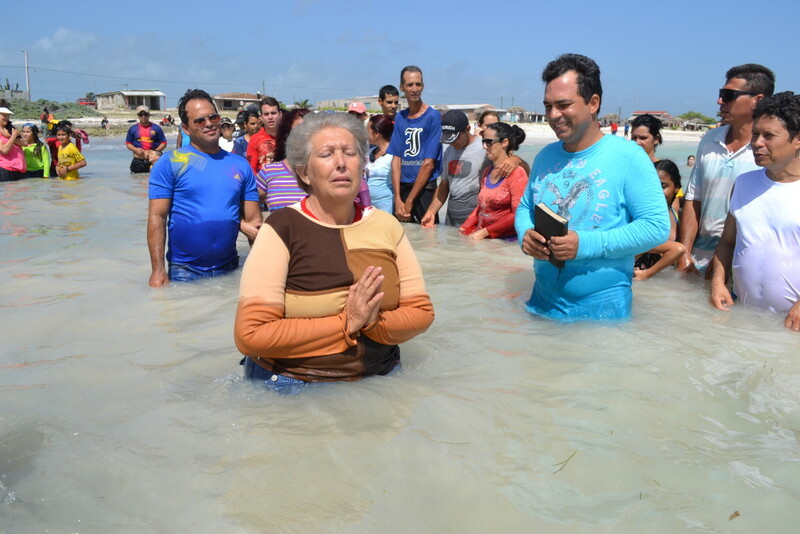 Third photo: Six people were baptized during a 2015 mission trip to Gibrara, Cuba, organized by members from the Potomac Conference’s Seabrook church in Lanham, Md.